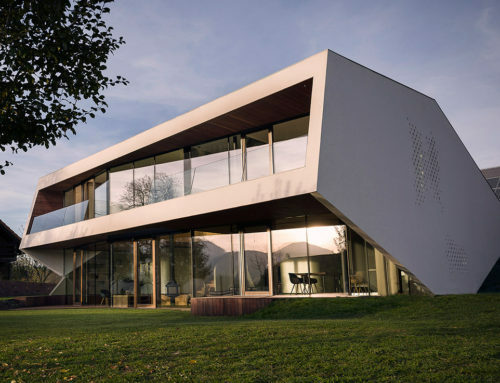 The new building is situated at the foothills of the “Wilder Kaiser” Mountain Range, directly adjacent to a former residential and care home that no longer corresponds to the required standards. 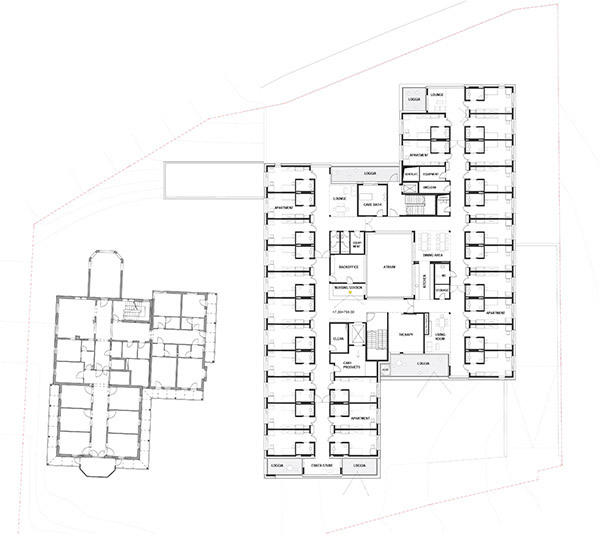 The building consists of two compact volumes interlocking at the central section where they form an atrium. Three different outside spaces are created by the positioning on the plot: a public garden, a separate dementia garden and a playground for children. The main entrance of the building is marked by a crystalline Y-support made of prefab concrete. The public areas are located on ground floor level. The Care Units are spread over the two upper levels with a total of 54 apartments. The outer surface is covered by a broom finished plaster. Wooden inlays of profiled larch boards accentuate the windows. The traditional system of cut outs and palings is translated contextually and used as screen providing privacy, protecting from the sun and painting subtle shadows on the facade. Tradition and modernity thus meet to form a harmonious whole. 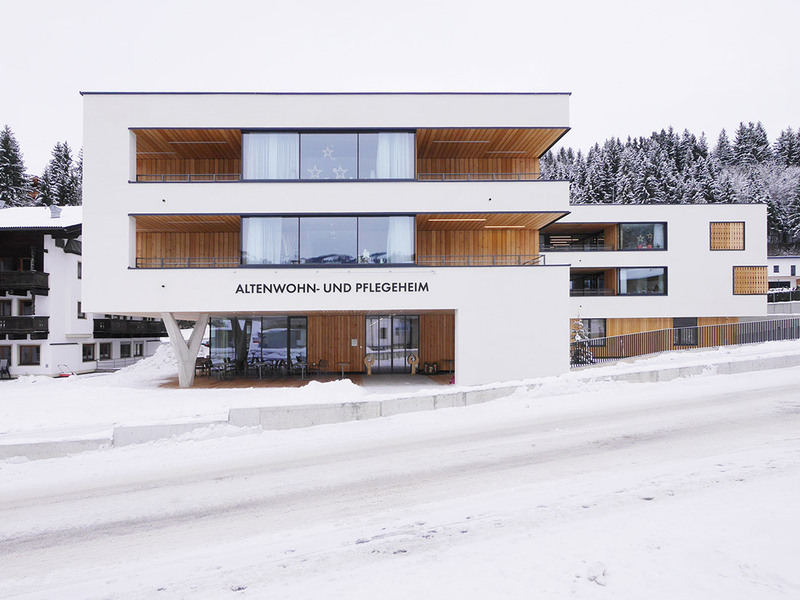 Three little Tyrolean municipalities – Ellmau, Scheffau and Söll – decided to pull together for a vision: The vision of an innovative retirement and nursing home that should be at the same time a social hub for the whole village, with café and event room. The new building and its apartments are equipped properly and designed in a modern way. Additionally, traditional craftsmanship is used as reference to past times. The new building acts as Catalyst for social life. 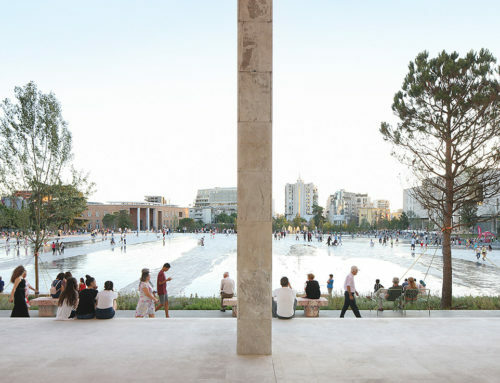 The differentiated formation of the structure enables communication and the encounter between the residents and the community. At the same time the interior and exterior spaces offer enough possibilities for private withdrawal and contemplation. Integration, Community and individual lifestyle do not exclude each other.